In the great Venn Diagram that is life, the intersection of the sets of board gamers and fans of the novels of Jane Austen is but a sliver. But what a mighty sliver it is indeed! Austen’s novels are a rich vein for gameplay with their resourceful, strong heroines, witty and flirtatious repartée, and a huge array of characters which Austen used to exemplify (and prick at) the foibles of the English class system of the late 1700’s and early 1800’s. However, it is only in the last ten years that designers have started to mine Austen’s novels as a theme for games. We start with the most straightforward tabletop adaptations of Austen’s works: Jane Austen’s Pride & Prejudice Trivia Game (2010) and The Jane Game (2014). The former is about as simple as you get: draw a card, roll a die, get asked a random trivia question, score points and keep going if you’re correct, end your turn if you’re incorrect. BO-ring. The latter shows a little more imagination: you actually take the role as an Austen heroine, and correctly answering trivia questions earns you Accomplishments which you can trade in for stuff, including a husband. 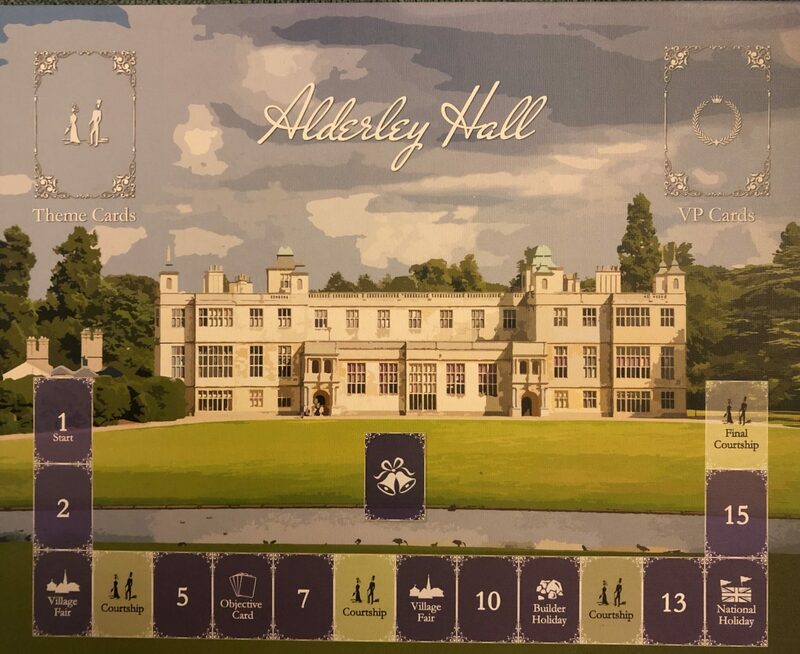 There’s a whiff of RPG about it, and the production value makes it an excellent gift for an Austen fan who’s not necessarily crazy about boardgames but willing to give one a whirl now and again. If it’s an actual RPG you’re looking for, then Good Society is your only choice as far as I know. I don’t own a copy of the rules but I did watch a Twitch livestream. It’s definitely in the modern “group-storytelling” vein, although a “facilitator” is required. Rumours, reputation, and letter-writing (!) all play important roles. I would really like to try this one out. Having served the opening courses, I move on to the main dishes. 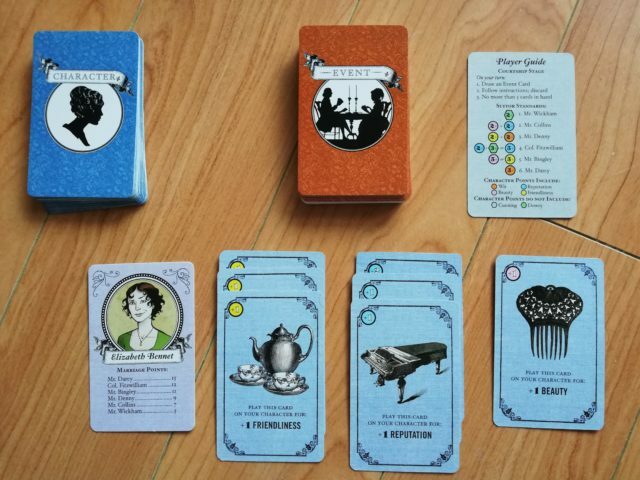 There are three boardgames which will nourish the soul of any Austen fan, and I will discuss them in order of weight (how gauche). 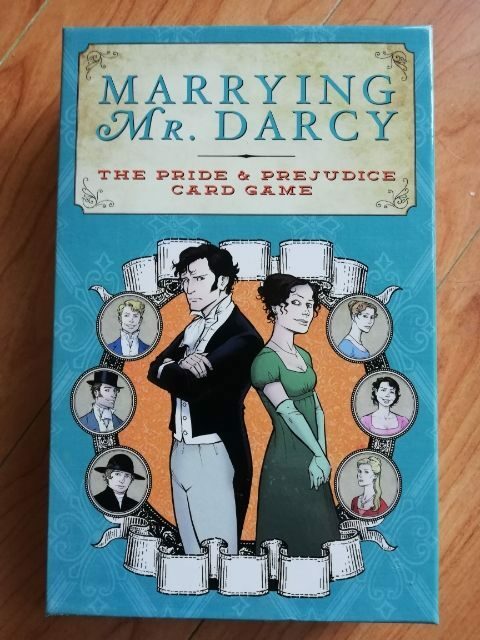 Marrying Mr. Darcy (2014) is a Munchkin-meets-Mansfield Park card game where each player takes the role of a specific Austen heroine and tries to marry as well as possible. Gameplay is very random, and split into two stages. In the Courtship Stage, you draw and play an Event card, either on yourself or one of your rivals. Most of the time you will be instructed to also draw a Character card, which you play into a tableau to build your stats (Wit; Friendliness; Beauty) to make you more attractive to prospective suitors as well as for game-end points. You can also play cards face-down to raise your Cunning, to give you an earlier shot at the suitors in the next stage; here there is an opportunity for bluff, because only actual Cunning cards count, but you can burn other cards to scare others off. After the Event deck has emptied comes the second stage: Proposal and Mawwage. Players take turns (in order of Cunning) running down the list of potential suitors in order. If you satisfy a particular beau’s requirements, you roll a die and if it comes up 4-6 he proposes. You can accept his proposal or push your luck and hope to get a “better” suitor (in terms of VP, of course)–and risk ending up (gasp!) an Old Maid. One nice twist is that the VP rewards for suitors vary depending on which character you’re playing, so if you’re Elizabeth Bennett you of course want Colin Firth (I mean Mr. Darcy). After every gal has had a chance to hook up, add up points for Character and Suitor and highest VP wins. To its credit, Marrying Mr Darcy adds some “optional” rules which add some ways to mitigate the randomness of the game, and I would definitely recommend adding both “Feminine Arts and Allurements” and “Dismissing Gentlemen Left and Right”, both of which make Proposal and Marriage a lot less frustrating. There’s a fair amount of “Take That” in the game–which is thematically questionable when it comes to say, Elizabeth Bennett sabotaging her beloved sister Jane–so be aware if playing with sensitive types. All in all though MMD is a fun light way to experience Austen’s world. There are two expansions: Emma, which adds characters and events from that novel to spice things up; and Undead, which adds…undead. Sigh. Still, can’t fault the designers for offering this, because Pride & Prejudice & Zombies is actually a Thing. Just not my Thing. Moving up the scale a wee little bit we come to 2018’s Polite Society. This is a self-published game from Australian designer Katharine Turner, and is currently only available as a paid PnP as the original print run has sold out. 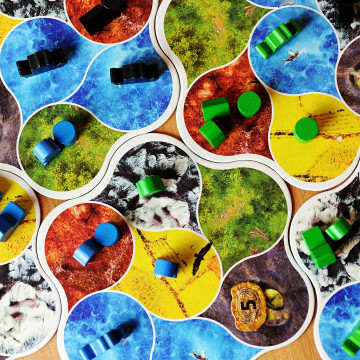 Turner has accomplished the admirable task of taking the basic mechanics of Catan, streamlining and improving them, and grafting them onto a theme that not only makes sense but allows for considerable entertainment. You see, it can be done! In Polite Society each player is attempting to fill their dinner table with a full complement of eight guests. The first person to do so is the instant winner. Each guest must be lured to visit by a unique mixture of Assets (Wealth; Wit; Beauty; Love) listed on the card. How do you generate these Assets? Why, from guests you have already lured. Eleanor Tilney (Northanger Abbey), for example, generates one Wealth and one Beauty–but only when the numbered seat she sits at is rolled by someone at the start of their turn. So it’s Catan but you get to assign probabilities to your lands. But there’s more! Some guests generate NO Assets–but they’re easy to attract and do fill a slot at the table. Is it worth grabbing one for one of your low-probability slots? And what about guests that force you to LOSE Assets? Poor Mr. Collins: you get dumber just by having him around! Things like this mesh theme and gameplay perfectly and make for interesting decisions as well. Instead of a robber when you roll a “7”, players get bonus Assets and the prospective Guest list is wiped and replaced (which gets rid of Guests no one wants)–both of which help move things along. Turner also use an event card mechanic (like Marrying Mr Darcy) but more strategically. 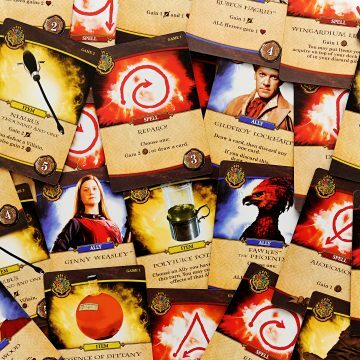 They’re called Action cards here, and you get to choose two and play one, which gives you at least some choice, and many of them help accelerate the game by giving you bonuses. Admittedly, others allow you to slow other players down by rendering one of their guests Indisposed (unable to generate Assets)–but guests can usually “recover” quite quickly. There are even optional Social Mission cards which make the game harder to win because now you must fill your table according to your Mission’s limitations: all characters from the same novel, or no character with a Wealth of more than 2, or each of your guests must have total Assets of at most 7, and so on. The Social Missions make for great asymmetric play, and make certain Guests who ordinarily would be very valuable worthless to you. 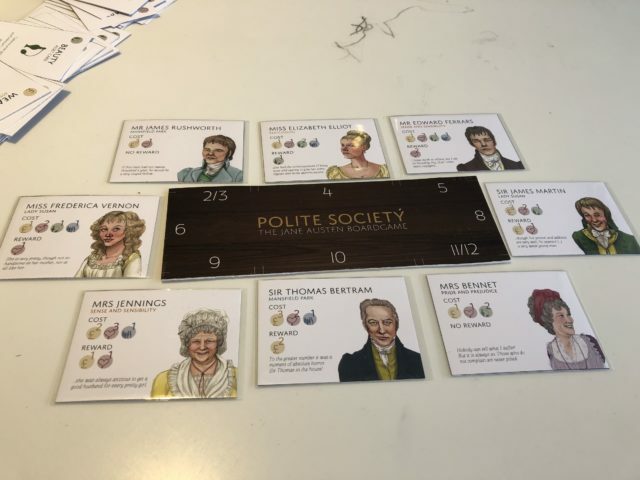 Polite Society is a great gateway game on its own for how it streamlines the Catan template, and for Austen fans it is even better. Finally, the pièce de resistance: Obsession. 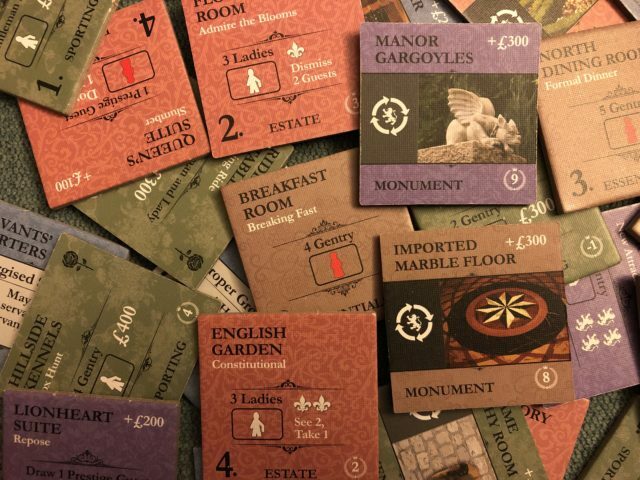 Those of you who know the game will object that it does not belong in this article at all because it is set in the mid- to late-19th century, more Downton Abbey: The Board Game than Jane Austen. And to that I say “pish” and “tosh” because although this is strictly speaking “true”, fans of Austen’s works will find themselves extremely at home in Obsession’s world, and furthermore if there is an Austen fan who is not a fan of Downton Abbey I have not yet met them. Harumph I say! 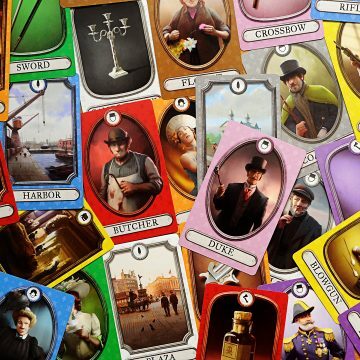 Obsession is a complex game with elements of deckbuilding and worker placement which are tightly woven into the theme. Players represent up-and-coming families and begin the game with a few cards each of which represents a family member. Each card determines the rewards, bonuses, or restrictions you get when that person hosts or attends an activity. Your ultimate goal is to amass the most victory points by a mixture of adding improvements to your estate, attracting the poshest guests to your activities and dinner parties, having an impeccable social reputation, amassing many and varied servants, not forgetting to sock away some savings and achieving as many Objectives as possible. Because it is practically impossible to do all of these, you have to leverage your family’s initial bonus (each one is different) and make the best use of the Improvements that come up in the central Market. There are 16 or 20 rounds in the game, depending on how long a game you want. Most rounds focus on hosting activities at your estate. The activities you can host depend on a number of factors, including the improvements on your estate, the servants you have available, and who you choose to host. Certain activities, for example, require that a Ladies Maid or Footman accompany the guests, so one must be available. Successful activities award the player some mixture of money, reputation, and new guests. Every four rounds there is a Courtship phase (basically a mid-game scoring) where each family compares its standing in a particular category; the winning family gets a visit from the fictional-but-highly-thought-of-nonetheless Fairchild family, whose presence at activities brings big bonuses as well as some plump VP’s. It is possible to win without ever winning a Courtship–but it basically requires being second-best at nearly everything, which is very hard. Like many Vlaada Chvatil and Fantasy Flight games, the rules are split between a main rulebook and a Gazetteer, which can sometimes be a pain in terms of looking up a specific rule. 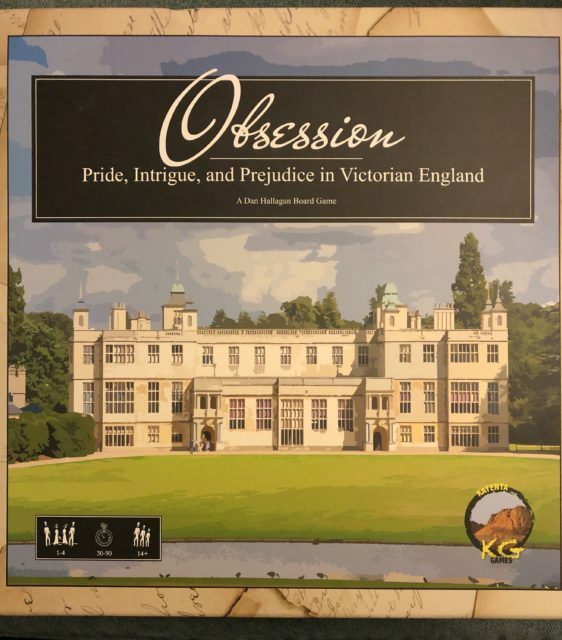 Obsession has a significantly steeper learning curve than Marrying Mr Darcy or Polite Society, but one way to teach the game is to play it in solitaire mode (very fun and challenging on its own) with everyone collaborating to make decisions, or you making the decisions and explaining everything as you go.